Hey fellas, let’s take a look at my picks for what I’ve found to be the most comfortable sweatpants for us men to be able to wear for when we’re working out in the gym or out for a run. Even though the main focus will be on comfort for my picks I will have looks also being a factor but it will be a small factor compared to how the sweatpants actually feel. Just a heads up, a strong focus point for my picks is the material used and how the waist band feels. Now let’s take a look at my picks shall we, I have them listed from my top pick down. Our top pick of this list is the Nike Mens KO 3.0 Sweatpants. A very high quality feel of these pants matches the high quality look them. I bought these one day while browsing around for some shoes and when I purchased them I didn’t even try them on, I just really liked the look of them. After I tried them on at home that night I went back up to the store the next day to pick up the same pair in the grey color as well. These fit great around the waist and lay perfectly at the ankles on your shoes. The Under Armour Men’s Armour Fleece Team Pants are very similar to the Nike Mens KO 3.0 Sweatpants in terms of quality and feel. 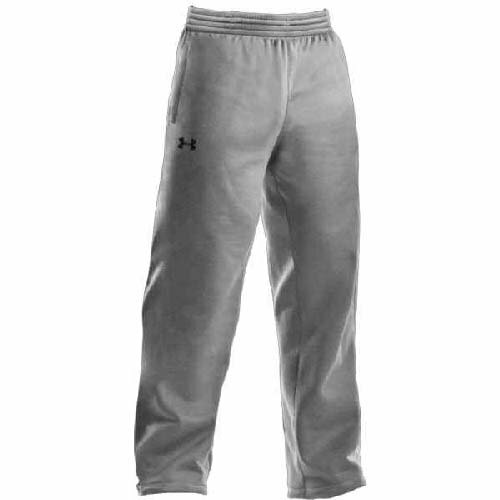 Under Armour did a great job with these sweatpants and have become extremely popular among st athletes or anyone really that is into fitness. They are great for running in as they are light, breathable and still do a great job of keeping your legs warm. These sweatpants have a great look to them that you can tell that they are high quality just from looks alone. There is also multiple colors to choose from. 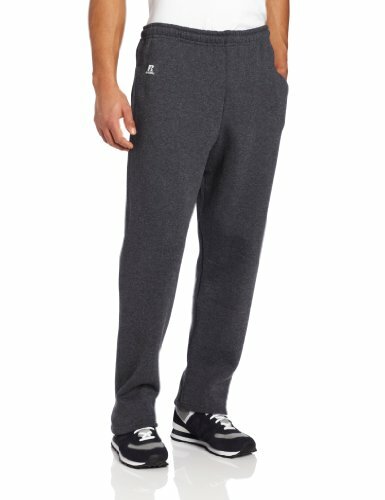 The Adidas Men’s Wide Leg Fleece Sweatpants comes in as our 3rd pick and our 1st non 100% polyester pair. 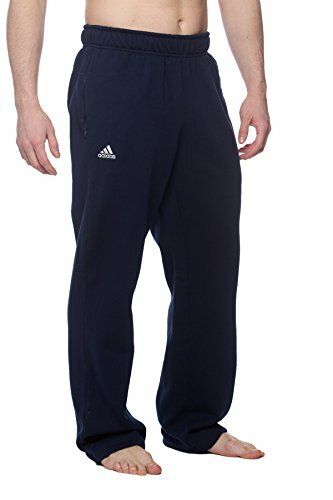 The cotton/polyester blend makes this a unique pair of sweatpants which works great for training. Another new feature to this list is the zippered pockets which I really like for when I’m in the gym. They provide a way for me to hold my ipod without it falling out when I’m on the benches. If you don’t like 100% polyester made sweatpants or 100% cotton ones for that matter then gives these a try. The Russell Athletic Men’s Dri-Power Fleece Open-Bottom Pant has a pretty ordinary look to them but they also have a great fitting comfortable feel as well. If you’re not looking to drop lot’s of money on your sweatpants but still want a good reliable pair then give these a try. There is a pretty impressive list of colors that these sweatpants come in at the time of writing this is 10. Russell Athletic products have always impressed me in terms of reliability to that’s another plus with these sweatpants. 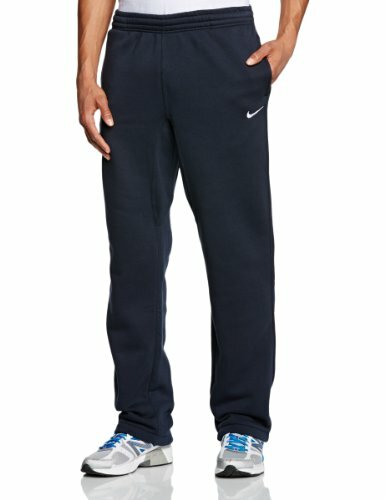 The Nike Club Swoosh Men’s Fleece Sweatpants Pants Classic Fit is another great pair of sweatpants from Nike. This pair being made more of cotton compared to the 100% polyester pair which came in at our #1 spot of this article. These sweatpants have a classic look to them and focus on a straight leg fit compared to the more relaxed fit that most of our other sweatpants on this list have been. The elastic waistband does a good job of providing comfort and not allowing them to slide but if you need to adjust further it does come with a drawstring. If you’re more of a cotton fan in terms of what you’re sweatpants are made out of then these may be a better fit for your rather than the Nike Mens KO 3.0 Sweatpants. Shopping for any kind of clothes in stores can be very frustrating because you have to make sure the stores has the brand you want then hopefully they have the right size for you then that you just hope that the color you were hoping for is available. The good thing about buying in stores is that you can make sure that the clothes fit before purchasing them. What I like to do is if I don’t know for sure what size I need in a brand then I try to find them in a local store to try them and then I’ll purchase them there if they have my size/color while being reasonably priced. If there is any issues with those things I mentioned then I just try on the closest size pair and then I can determine which size to order from online. With ordering online you’re usually able to get a better deal and also you usually get a much bigger selection color wise. Doing this allows you to purchase them in bulk if you wan to get multiple pairs. Buying directly from the manufacturers website tends for you to pay the most which doesn’t make much sense considering you are cutting out the middle man but that’s what I’ve noticed on almost all clothing. This is why I recommend looking for re seller stores which price them more competitively or try to buy from amazon. Another perk of buying sweatpants online is you can shop around for price literally with a few clicks compared to driving all around town wasting gas/time hunting down that one pair of sweatpants.